To celebrate our 50th anniversary the club is planning an expedition to Sikkim. 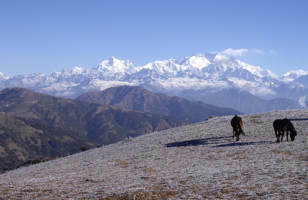 The basic plan is for a trek along the Singalila Ridge. This runs close to the former hill-station of Darjeeling northwards towards the towering presence of Kangchenjunga (8586m), the world's third highest peak, and forms a natural border between Nepal and India. The scenery is spectacular. The area has a particular place in mountaineering history in that the early Everest Expeditions all passed this way – through Darjeeling and Gangtok and over the passes into Tibet before turning west to reach Everest from the north. It therefore has local history as well because we would be in the footsteps of the 1921, 1922 and 1924 parties with Mallory and Irvine, who both had connections with the Wirral.